The Mascarene Islands of the Indian Ocean: Mauritius, Rodrigues and Reunion, have suffered the disappearance of a number of unique species whose influence would have been considerable upon their native fauna and flora. 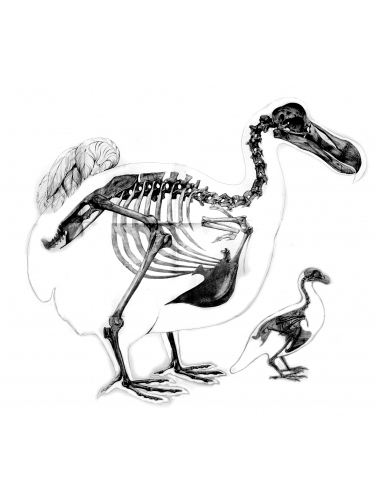 The 'Bones to Bronze' project was conceived to realise extinct creatures in three-dimensional form using the most thorough archival research combined with forensic techniques to extrapolate from the meagre remains that still exist. Dr Carl Jones, Director of the Mauritian wildlife conservation programme for many years, together with Rungwe Kingdon and Claude Koenig, directors of Britain's leading sculpture foundry, Pangolin Editions, enlisted the help and expertise of Dr Nick Arnold of the Natural History Museum, Errol Fuller and Dr Julian Pender Hume, authors in the field of extinct species and Natural History. Their conclusions became the raw data which enabled the sculptor Nick Bibby to use his skill and knowledge to recreate three-dimensional models of the chosen species. A bronze cast of each has been permanently sited on the Ile aux Aigrettes, which lies off the southeastern shore of Mauritius and has become the Mauritian Wildlife Foundation's conservation showpiece. The aim of the project is to draw attention to the tragedy of extinction and the significance of our loss and also to inspire a deeper understanding of the vital need for conservation. The sculptures are cast in bronze in limited editions of ten. They are available for sale and profits provide funds for the Mauritian Wildlife Foundation's conservation programmes.